Mary Humphreys andAnahata are back for their third visit. 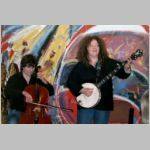 Mary's stunning voice and banjo playing and Anahata’s cello and concertina playing make for a captivating evening. Some wonderful versions of familiar songs and plenty of opportunity to join in.